Portuguese laurel or prunus lusitanica similar to cherry laurel is in many ways, but it belongs to a different species. Portuguese laurel hails from France, Spain, Morocco and Portugal – hence the name – and is generally hardier than cherry laurel. Also, it is happy growing in chalky, alkaline soil, whereas cherry laurel is not. Portuguese laurel is fairly high maintenance right after planting and needs to be watered and fed until it is well established. After that, Portuguese laurel is not a particularly demanding, hedge plant and you will see good results from an annual clipping. Like most cherry laurels, Portuguese laurel can be trimmed to both a formal and more natural shape, but in both cases it tends to have a rather luxurious and classical appearance. Prunus lusitanica is a shrub of compact habit and grows a moderate 15-30cm a year, with a final height of 1-5m depending on growing conditions, soil and maintenance. It can take anything from full sun to full shade and can handle all but the most windy spots. 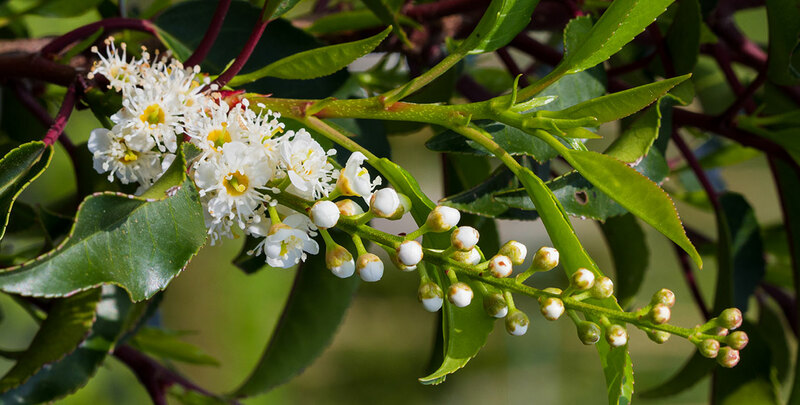 Clusters of white fragrant flowers that attract bees and butterflies make way for bird-friendly berries in autumn. This dense evergreen hedging species boasts striking dark pink stems and pointed dark green leaves that make it a lovely addition to any garden all year round. Not unlike the cherry laurel, the Portuguese laurel is often planted by people who want an evergreen hedge that provides year-round screening, but do not like the relatively monotonous look of a classic conifer hedge. It is true that both the cherry laurel and the Portuguese laurel have a more informal appearance than the look people traditionally associate with evergreen hedge plants. This is mainly due to the beautiful leaves of both species, that have an astonishing sheen to them. The leaves of the Portuguese laurel are about 6 to 12 centimetres in length and an essential part of the beauty of this hedge plant. Because of these leaves, we highly recommend you use a small pruning tool, such as garden shears, for the annual trimming session to avoid damaging them. Like most cherry laurels, Portuguese laurel can be trimmed to both a formal and more natural shape, but in both cases, it tends to have a rather luxurious and classical appearance. Prunus lusitanica is a shrub of compact habit and grows a moderate 15-30cm a year, with a final height of 1-5m depending on growing conditions, soil and maintenance. It can take anything from full sun to full shade and can handle all but the windiest spots. Clusters of white fragrant flowers that attract bees and butterflies make way for bird-friendly berries in the autumn. This dense evergreen hedging species boasts striking dark pink stems and pointed dark green leaves that make it a lovely addition to any garden all year round. Portuguese laurel is not the easiest plant to grow and maintain, but any effort put into making your garden the perfect home for this luxurious looking evergreen hedge plant will be rewarded by its incredible appearance. 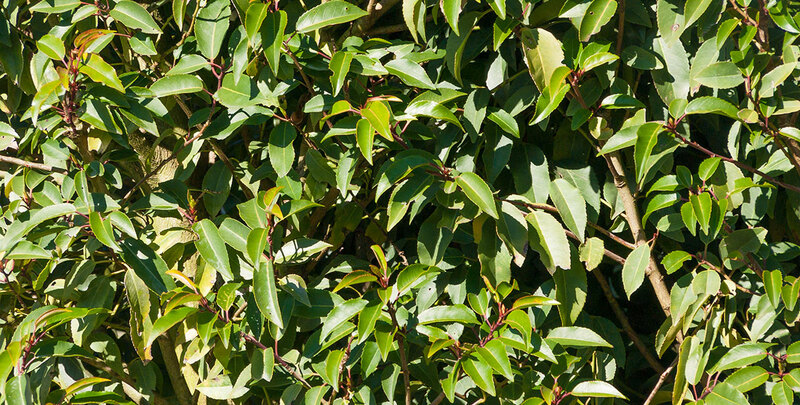 Just like the cherry laurel, a Portuguese laurel hedge will combine all the benefits of evergreen hedging with an unusually playful character. If you live in a relatively cold area, such as the north of Britain, the Portuguese laurel may even be a better choice than the cherry laurel because of its hardier nature. If you are looking for an evergreen plant with a similar look, but your garden is located in a more exposed area, the spotted laurel may be the right hedge plant for you.